Changing the look of your home doesn't need to cost much. You can clear the clutter and use items you already own to completely change the feel of your space. 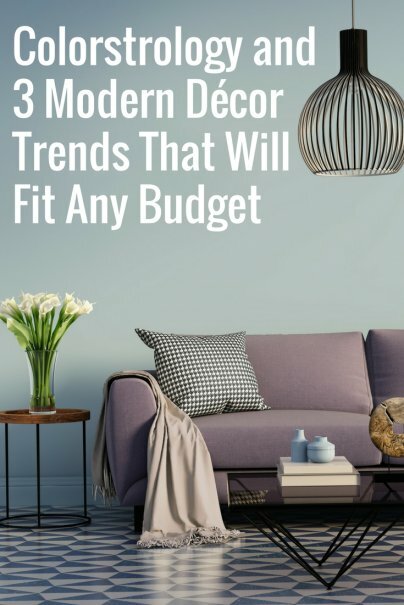 Here's how you can breathe new life into your casa with these affordable modern décor trends. Colorstrology is a hybrid of astrology, numerology, and Pantone colors. Astrologist Michele Bernhardt created a calendar and corresponding book, Colorstrology: What Your Birthday Color Says about You, with a different Pantone color assigned to each day of the year, as well as one for each month. The colors are chosen based on ruling planets, sun signs, and other important dates and numbers. While there is quite a bit of science and success backing the new colorful trend, a lot of it is psychological. As an example, Bernhardt told Goop that if you're looking for help with your relationship, "You might go to October's color, which is a light blue that is very peaceful and gentle; it helps bring harmony and balance. Or February — a high vibration purple — is a great color for people who are intense, and trying to learn how to be more detached and collaborative. Lilac and lavender can help us love without being too clingy." Incorporating these colors into your décor can help bring about positive energy. For instance, you can add a splash of color to any room by painting the trims or one accent wall with a shade in your birthday month color. You can also move certain items into different rooms so they are more color-coordinated, based on the shades you select. Along with using these colors throughout your décor, you can also wear these power colors throughout your clothing, accessories, or makeup each day to capitalize on the positive vibes. Mindful color selection like this might require some time to get organized, but it should cost you very little money to execute. Create a cohesive look by concentrating on one simple design and complementary accent decorations. This can be accomplished by paring down to one or two accessories per room, and you can you use things you already own. Also, be sure to keep and utilize furniture that serves double duty as storage or that takes up minimal space. Once you have gotten rid of anything that you aren't excited about and narrowed your items down to just the essentials, it's time to concentrate on your personal style. Simplify your color scheme and choose textures in similar tones. Adopting a minimalist style also means easier cleanup (less to dust), and you might even make some money selling those excess items that you no longer want. While minimalism is about "less is more," maximalism is about "more is more." Maximalism has no set rules; you can even layer different colors, textures, and styles. Things like bold wallpaper and clashing patterns are acceptable with this affordable trend. This means that you can show off your latest vintage finds or eclectic paintings with pride. If a room appears small, add a mirror to make it appear larger. If you don't want to hang a mirror, consider propping a large framed mirror against a wall. It can create drama and brighten the space instantly. Take a look around for posters or cards you already own that can be framed, unique items of clothing or shoes that can be displayed, or antique pieces that can serve as the focal point of a room. And if a room doesn't feel cozy, Better Homes and Gardens recommends adding a colorful throw and pillows. Use items you find outside your home in nature to decorate your space. Birch tree limbs and pine cones can be spray painted in white or gold for decor. Rocks, shells, and leaves can also create beautiful (and free) art pieces or table scapes.